I’m an author, speaker, career coach and business strategist living in New York City. I love helping awesome people like you organize your brain, move beyond burnout and build a sustainable career you love. I’m fascinated by strategies for navigating change in our rapidly-evolving economy, and I geek out exploring and creating systems at the intersection of mind, body and business. I live for helping smart, talented, optimistic people like you embrace chaos, fear, insecurity and uncertainty as doorways of opportunity. My motto: if change is the only constant, let's get better at it. No big leaps required; what small experiments can you run starting from right where you are? How would you structure your days? Your income? Your time? These are the questions I ask and answer through my book Pivot, my Pivot podcast and weekly PivotList missives. Kick off your shoes and get comfortable. I’d love to help you dig up and (re)discover your passions, interests, and big ideas as I do the same. The welcome mat might have my name on it, but this is a place for all of us to learn and grow from each other. Jenny Blake, career and business strategist and former career development program manager at Google, reveals how to methodically make your next career move by doubling down on what is already working. If change is the only constant, let’s get better at it. "A sharply reasoned and immensely practical guide to crafting a meaningful working life in an unpredictable world." "If you don't manage your career, who will? Jenny Blake is here to remind us that we live in a different time, and the possibilities are endless—as long as we're willing to pivot." "It's not a matter of if you'll need to pivot your career, it's a matter of when. 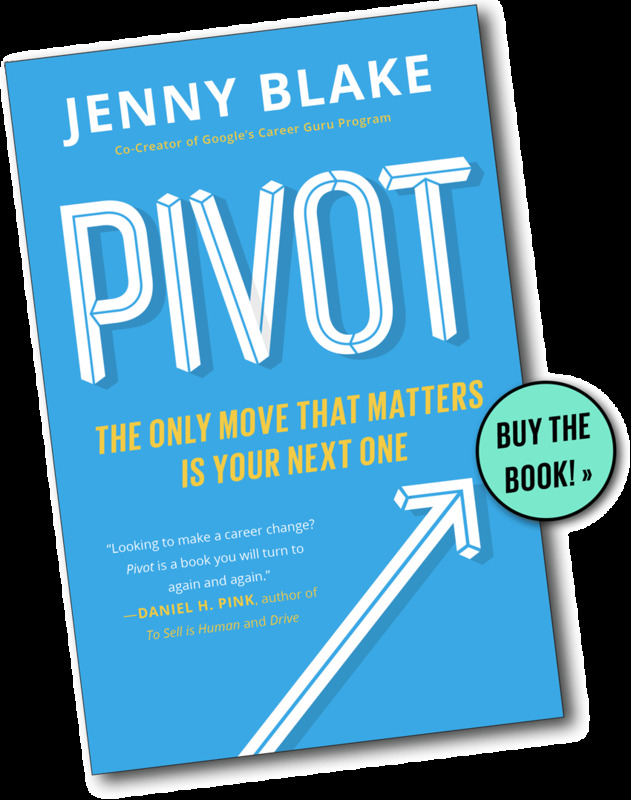 Let Jenny Blake show you how with this wildly practical guide to the career changes headed your way." "Non-traditional career journeys are not only the new normal; they're how innovators throughout history changed their world and ours. With actionable insights and lucid prose, Jenny Blake illuminates the path to building your own destiny." "Are the tectonic plates below your sturdy career suddenly splitting into a deep abyss of unknown? Let this book be your rope ladder out." Jenny’s passion is in helping people move beyond burnout to create sustainable, dynamic careers they love. She helps audiences ditch the rigidity of yesterday’s career ladder, instead treating their careers (and lives) as dynamic, constantly customizable apps on a smart phone. Whether talking about career pivots (even mapping next moves within one's existing role), speaking like a pro, or training managers to have better career conversations, beyond just inspiration, it’s Jenny’s interactive format, how-to tools and templates, and loving encouragement that keep people coming back for more. Jenny Blake is an author, career and business strategist and international speaker. She loves helping people organize their brain, move beyond burnout, and build sustainable, dynamic careers they love. She is the author of PIVOT: The Only Move That Matters is Your Next One (Portfolio/Penguin Random House, September 2016), which recently won an award for Axiom Best Business Book in the careers category, and Life After College (Running Press, 2011). In 2017, PIVOT wan an award for Axiom Best Business Book in the careers category. JP Morgan selected PIVOT for their client #NextList2017, Business Insider named it among the 20 best business books of 2016 and 7 books that will change the way you work in 2017. Jenny has been featured as a career change expert on CNBC, in The New York Times and The Sunday Times UK. Her Pivot Podcast is a top rated show that CNBC listed among 6 podcasts to make you smarter about your career, and selected by Entrepreneur as one of the top 20 female-hosted business podcasts. Today you can find her at PivotMethod.com. Subscribe to the Pivot Podcast and follow her on Twitter @jenny_blake. She is based in New York City, where she imagines she’s starring in a movie whenever she walks through its crowded streets. A one-hour Pivot workshop that anyone on your team can lead in addition to, or in place of, a kickoff keynote with your organization. You'll have everything you need to facilitate at your fingertips, with a dashboard to track group participation and follow-up. Join me as I talk with peak performers to reverse-engineer their career pivots, interview experts on what it takes to be agile in a rapidly evolving economy, and open the kimono on what happens behind-the-scenes of my book and business. A private community for solopreneurs and side-hustlers. Get instant access to $700 worth in courses—including Speak Like a Pro ($150) and Build Your Business ($150)—live workshops, bi-weekly Q&A calls, and private Facebook group. Looking for more personalized one-on-one support? Sign-up for a one month coaching pilot to plan your Pivot. Each of the Pivot Coaches has a strong focus on mind, body and business—and was selected for their depth of experience. You are in great hands!